Progressive Charlestown: No tax cut for you! Big profitable corporations got a 40% cut in their tax rate. And the new tax rate on the foreign profits of U.S. companies is only half the domestic rate, creating big incentives to shift jobs and profits offshore. 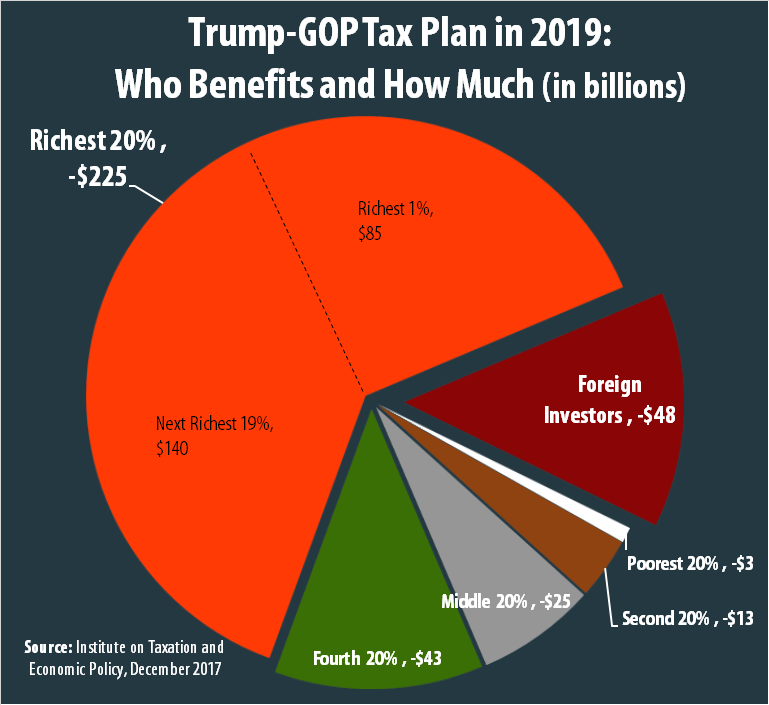 Republicans desperate to enact their skewed-to-the-rich tax plan assured the American people the tax cuts would pay for themselves. Wrong. The federal budget deficit jumped by almost $100 billion in the first quarter of the current fiscal year alone compared to the same period last year, before the Republican tax law went into effect. Contributing to that growing budget gap was a nearly one-third drop in corporate tax receipts. Rather than reverse all their tax giveaways to the wealthy, Republicans want to make up the shortfall by cutting public services working families rely on—while, incredibly, cutting taxes on the wealthy even more. In his recently released budget, President Trump proposed slashing $1.4 trillion from Medicare, Medicaid and the Affordable Care Act (ACA), while cutting taxes by $1.1 trillion, once again mostly to the benefit of the rich. Trump doesn’t just want to cut the ACA’s budget—he wants to eliminate it altogether. That would cost 20 million Americans their health insurance, while taking away the protection for 130 million people with pre-existing medical conditions who would pay more or not be able to afford insurance without the ACA. Trump promised workers would benefit from the corporate tax cuts, guaranteeing that working families would get a $4,000 boost in wages. Nearly a year-and-a-half later, according to a tally by Americans for Tax Fairness, only 4% of employees have seen any increase in their compensation tied to the tax cuts, and the great majority of those payouts have been one-time bonuses, not permanent raises.